"Lots of character development, but too late in the game"
I'm not entirely sure what to make of "The Other Side." On the one hand, it was nice to see some character development for both Rosita and Jesus, after both characters existed as blank slates for too long. But on the other, why did it take the show so long to give us insight into both of their pasts? It's not as if Rosita or Jesus haven't been a part of a number of central storylines throughout their time on the series (more so for Rosita, who has been around for years at this point, but has only been defined by her relationships with male characters on the series), so why wait until this late date to give us some idea as to what makes them both tick? At this point in The Walking Dead, one has been conditioned to just accept random outbursts of character development without warning or lead up. So, with that in mind, I will just decide to be pleased that we even got backstories for them, even if they were long overdue. Throughout this season it's been clear that the writers have wanted to do something with Rosita, but they have been woefully unable to decide what exactly that something is. So, rather than give Rosita a coherent storyline, they opted to just make her angry. She was mad at Sasha. She was mad at Rick. She was mad at Negan and the Saviors. She was mad at the world. But that was it. Nothing more, nothing less. Making a character angry is all well and good, but it can't be the only thing going on with the character- especially when it's the only thing over the course of 14 episodes. 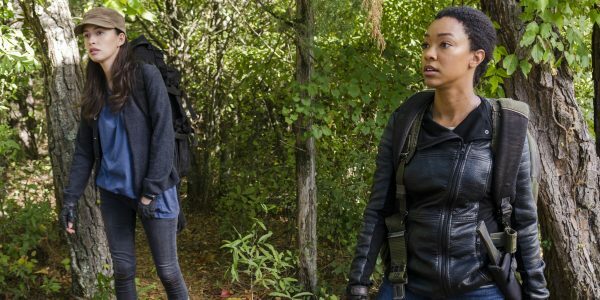 [caption id="attachment_94396" align="aligncenter" width="600"] Sonequa Martin-Green as Sasha Williams, Christian Serratos as Rosita Espinosa - The Walking Dead Photo Credit: Gene Page/AMC[/caption] Rosita's lack of a story clearly wasn't a commentary on Christian Serratos's acting abilities, as she proved last night that she is a talented actress who can handle an emotional story arc just as well as Sonequa Martin-Green (who, in what we can assume is her final season on The Walking Dead, has been turning in some excellent performances with not a lot of screen time). Which means the writers just didn't know what to do with Rosita until they could team her up with Sasha for the kamikaze kill Negan plan. I will say I'm heartened that Rosita appears to be heading back to The Hilltop with the knowledge she has to live to make Sasha's sacrifice worth it (assuming that was Daryl she ran into and not Dwight- in the dark, a man with a crossbow is hard to distinguish). This gives the series a chance to continue to build and develop Rosita moving forward. As for Jesus, it was great to get a bit of his background (and a nice touch that the show offered a low-key coming out moment for him), but did we really need him to explain how he's always had a hard time getting close to people over the years? Wasn't that pretty obvious throughout his time on the series? He's been aloof to everyone at The Hilltop and only spend time with the Alexandrians (which isn't all the surprising considering the main thrust of the series isn't at The Hilltop), so we've known that since his earliest days on the show. It was nice to get Jesus talking about who is was, but I'm not sure it really gave us much more insight into him as a character than we previously had. Outside of those two character histories, not much really happened this episode. Yes, Sasha is probably on her way to her death (and I suspect Negan will make it out in one piece), and Eugene remains a coward, but one who has an exceptional ability to adapt to whatever situation he finds himself in and make himself useful (something I hope the show explores once he's reunited with the rest of Team Rick). With only two episodes remaining this season, I'm not sure we'll be able to get any sort of major battle underway, as the Alexandrians need to get the guns from Oceanside and then get them back and plan an attack. That's an awful lot to do over the course of two to three hours of television (I'm assuming at least one of the episodes will be supersized, as many recent episodes have been). But for the first time in awhile, I'm actually interested to see what state the series will be in going into next season. Hopefully it is without Negan. 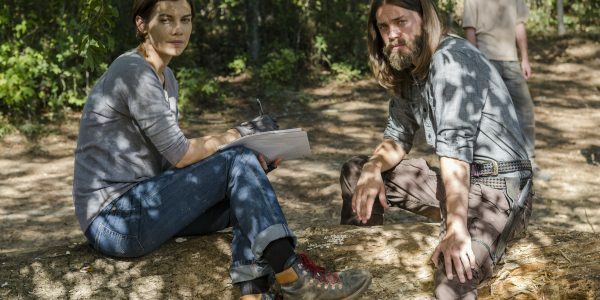 [caption id="attachment_94395" align="aligncenter" width="600"] Lauren Cohan as Maggie Greene, Tom Payne as Paul 'Jesus' Rovia - The Walking Dead Photo Credit: Gene Page/AMC[/caption] Final Thoughts: -- While I enjoy spending individual time with characters, I still wish there were fewer characters on the gameboard at this point. I suspect there will be fewer come the end of the season, but I hope the show doesn't just add more to the mix. When it takes this long to give Rosita and Jesus some background, that's a sign that either the series isn't interested in developing the characters it has (a distinct possibility, but an incredibly troubling one), or that the show doesn't know what to do with those it has. -- How is Gregory still alive? How hasn't he gotten killed with his inability to act? I suppose, in the apocalypse the strong and the cowering both can survive. -- I'm glad Maggie seems to be settling in well at The Hilltop. And I'm glad she and Daryl had that chat.